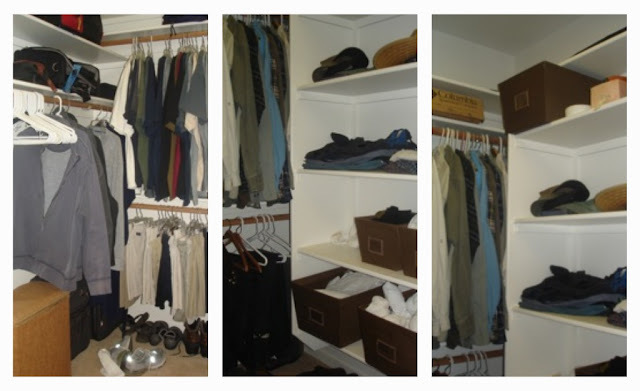 One of the first things I did last week in my trip to Chico was to help them with their master closet. Before I left, my client had sent me a series of emails and photos of each room that she wanted help with. 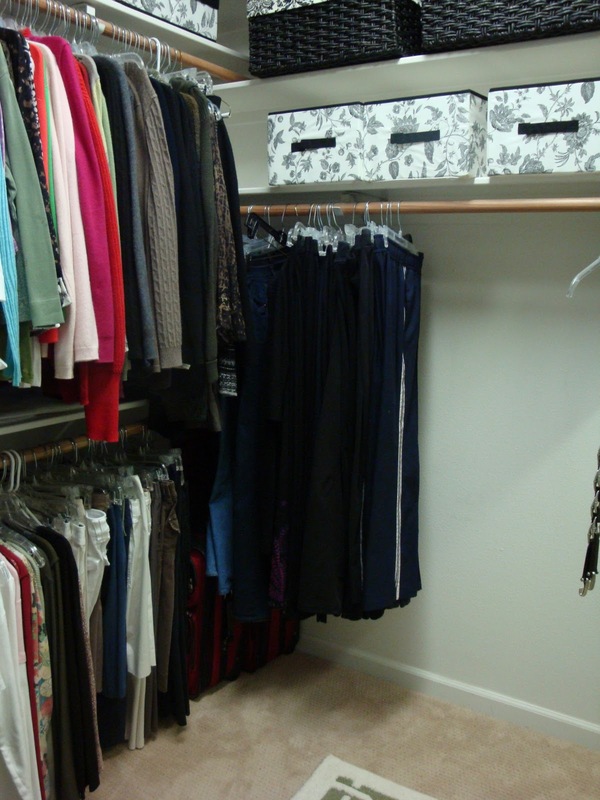 She is very organized and neat but she was having some issues with her closet and just couldn't get it to work the way she wanted. Her clothes were all in order and she had gone through and taken out what she didn't wear, etc. so having too much was not the issue. The client had a couple of concerns and there were a few things that bothered me as well. She did not like their shoes on the floor but did not see any other solution. She also needed an area for costume jewelry, glasses and such. And the laundry basket was a big problem. She liked the way it functioned and the size and really wanted it to be the closet but she didn't like the looks of it. 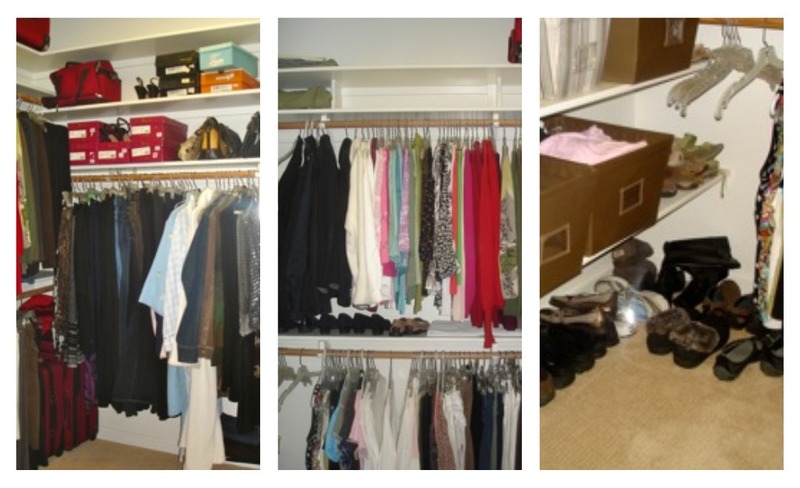 Problem: needs area for everyday jewelry & glasses, shoes on the floor; generally unhappy with closet! 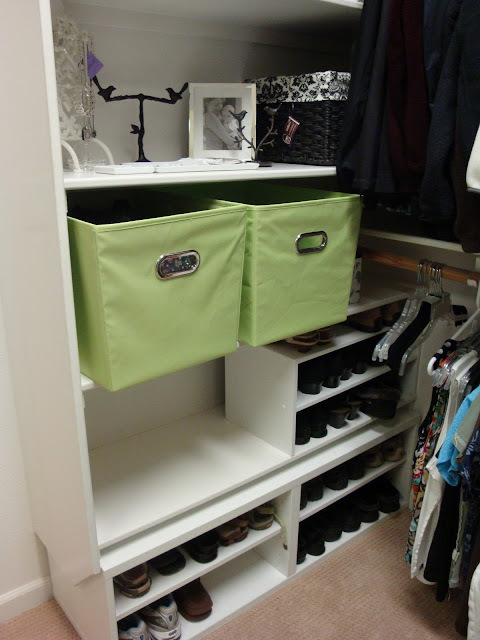 Instead of using a dresser they were utilizing all the shelves in the closet and she had purchased matching canvas bins to keep things like socks, underwear, pajamas, etc. I think that can be a good solution if you have no other choices, but when I surveyed the closet I thought I could do a little better than that for them. The problem: The laundry basket (to the left), the canvas bins for clothes, and the shoes on the floor. 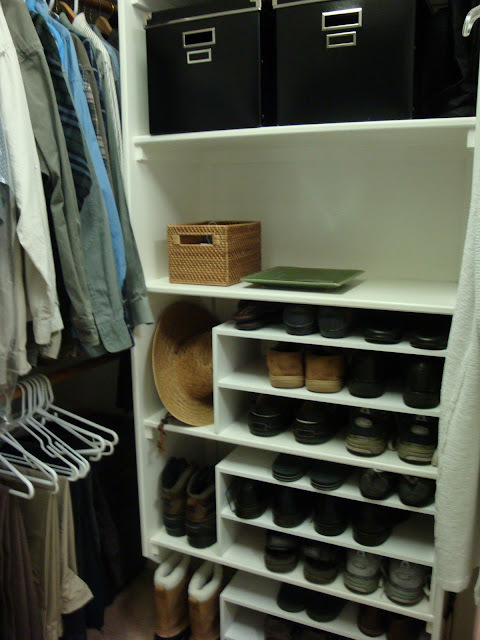 I started with the husband's side of the closet and addressed the shoe issue first. There is just something like shoes all lined up in rows that makes me happy. Even though the shelves were 15" apart and non-adjustable I was pretty sure that I could make the shelves work for the shoes. But that would require that I take the canvas bins off and put those clothes somewhere else. If you have read this blog much you will know that I prefer drawers to shelves whenever possible so I tried to figure out a way to bring drawers into the closet. 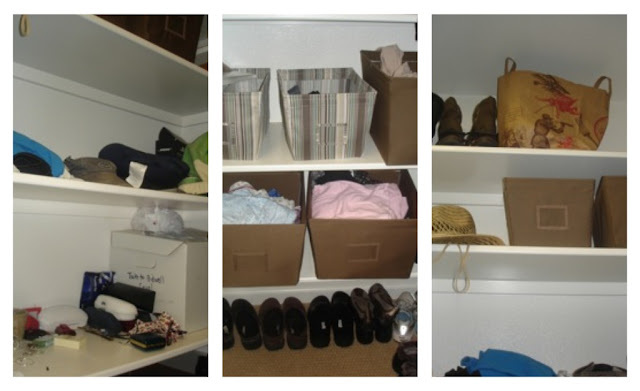 Shoes all lined up nicely, new bins for extra storage and an area to drop key, glasses, etc. I purchased inexpensive shoe organizers from Target and placed them on the existing 15" shelves. There was a little space left over which worked perfect for the boots. It is not 'custom' but a great improvement! Each unit cost $10 so this was a $30 improvement. 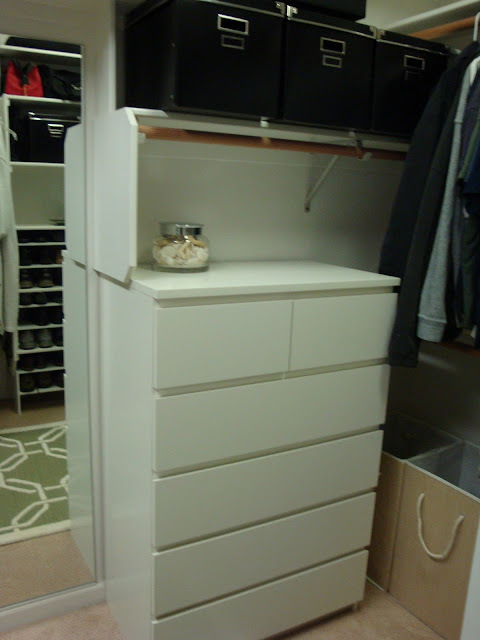 I selected the Malm 6-drawer chest from Ikea which fit perfectly in the space and gave ample drawer space for all the clothes that were on the shelves. The chest cost $149.00. We also added a beautiful rug from Cost Plus World Market for $119 and two new laundry bins. This side of the closet will have the same Ikea dresser added to it. For the other side of the closet I needed more shoe space and also I could not utilize as much of the shelves as I did for the other side. I used the Besta shelving unit from Ikea ($70) to fit underneath the shelves and just one of the $10 target shoe shelves. The rest of the client's shoes that were stored in boxes will be put in matching plastic shoe boxes ($.97 at Walmart) and placed on the upper shelves on the same side as her other shoes are kept. New shoe shelving and jewelry area. Bins and baskets for extra storage. Baskets from HomeGoods, canvas bins from Ikea. The closet makeover was a big success as it was inexpensive, was done in one day, made the closet appear larger, gave them more room for clothes storage and looks pleasing. A couple of things that didn't get done due to time restraints was changing out the hangers to the slimline flocked hangers which will give them even more space and a uniform look to the hangers. You can see them here. Are you inspired? Happy Monday! Hi PK! I know, the rug is great and I meant to make a comment about not having a good view of it - I took the photos in such a hurry as I was getting ready to leave and since there were parts of the closet that were unfinished (the other dresser, an ottoman) I tried to capture what was finished and missed the cute rug. 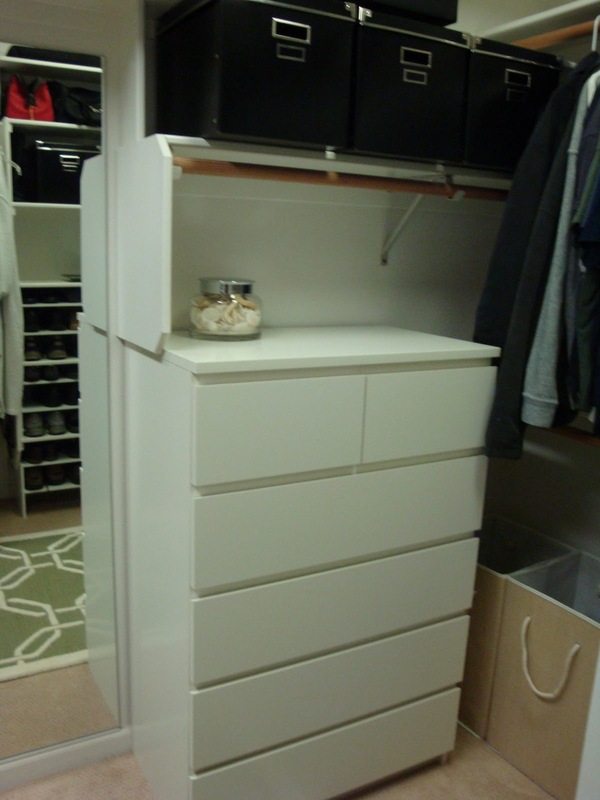 I am hoping when the client gets the other dresser they will take a better photo of the closet. Wow! What a great makeover! Inspires me to get in my closet! Great storage finds at great prices! You did such a good job. Great job Sherri! I love the pops of green with the black and white and the jewelry area....very pretty! My 100th post and a GIVEAWAY! Is organizing a four letter word?